I had intentions of writing a follow-up post covering my experience with shooting laser beams into my eyeballs shortly after my procedure. A Cliffsnotes version of an abbreviated draft was simmering, waiting to be finalized. Then life decided to flare up and get crazy. There were two trips to Wisconsin to see my grandfather and then to attend his funeral. Our house went onto the market and we received seven offers in less than 48 hours. We closed on both houses, only to pack, clean, and clear out one house in order to move into the other. Then the fun began. Unpacking, organizing, decluttering, sorting, decorating, making the house ours. All the while, I have this pesky thing called a job taking up big chunks of my time. Oh yeah, there are two little rugrats running around that we are responsible for, as well. We have been busy. Back in March, I had eye surgery to correct my 20/400 vision. That day was exciting and scary all at once. After doing all the administrative stuff, they sat us in a room where I could relax and Sarah could feed Carson. When they finally came to get me, the tiny sedative had done just enough to take the edge off and I was ready to go. I looked at Sarah one last time - you never know right. She had already assured me that she would not immediately leave me if I was blind after that day (jokes, people). They took my glasses and I blindly stumbled into the operation room. I laid on the bench and the equipment slid over my face. One eye was patched, the other was pried open and positioned to be looking right at a green blinking light. They put in drops, cleaned, scrubbed, put in more drops, put in more drops, cleaned more, and added more drops before they placed a tube right on my eyeball. I felt suction and then my world went dark. During my contacts days, one of my biggest fears was being in a situation where I did not have my glasses or contacts available to me. 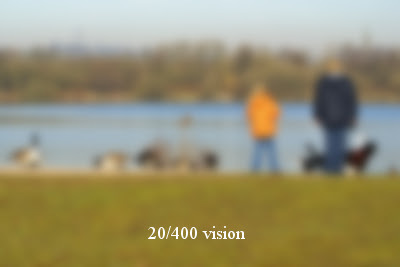 My vision was bad enough that I could not function without some sort of correction. Before any trip, I would neurotically quadruple check to see that I had my glasses and extra contacts packed just in case my contacts would rip. So what is the one thing worse than functional blindness? Full blindness. So there I laid in the darkness - one eye was patched, the other just went dark; hoping that my fears were irrational. After what feels like eternity, the lights showed back up. As the lights started to appear, I noticed something peculiar. The lights were patterned at the bottom of the machine in little hexagon shapes. Hexagons. Wait a minute. HEXAGONS?!! I could see the patterns of the lights!! I was not blind any more! During the excitement, the doctor added more drops, cleaned the corrected eye, and repeated the process on the other eye. In total, I was in the operating room for 6 minutes. When I stood up, I could somewhat clearly see Sarah and Carson sitting in the observation area (of course Sarah watched the whole procedure, sicko). I read the clock on the way out of the room. The whole world had a smokey haze hovering over it, but things were recognizable. I loved my bionic eyes already. Looking back, I should have done this so much sooner. It is amazing. I don't even remember what life with contacts and glasses was like. (This is a lie. I remember quite well and it sucked.) At each of my follow-up appointments, the doctors have been kind enough to show me what looking through 20/400 eyeballs look like. What a happy reminder of the difference before and after. For anyone out there interested in going through this process as well, I would highly recommend 20/20 Institute. They are incredibly professional, thorough, and willing to spend as much time as needed to ensure that you are comfortable with the process you are about to undertake.